With about 22 million believers, Muslims comprise less than two percent of China’s population, divided predominantly into 10 different ethnicities. The two largest Chinese Muslim groups are the Hui and the Uyghurs. While the former — mostly settled in the central part of the country in the Ningxia Autonomous Region and the Gansu, Qinghai, and Yunnan provinces — has managed to integrate well within Chinese society, the latter, a Turkic minority of 10 million people living in the Xinjiang Autonomous Region in the northwest, continues to suffer from severe repression and persecution. Last summer, the Hui made the news for protesting in the thousands against the announced demolition of the newly built Weizhou Grand Mosque; however, the Uyghurs have faced much more serious attacks over the past decades. Religious practice in Xinjiang is closely controlled by the Chinese authorities since militant Islamic separatist groups asking for the independence of East Turkestan have formed in the region, and the conflict between government forces and local activists has turned violent on various occasions. Xinjiang is said to be one of the most heavily policed areas in the world and reports of human rights abuses abound. In 2017, it was reported that 200 mosques had been destroyed in the area and 500 more were scheduled for demolition. It is also estimated by the United Nations that nearly three million Muslims have been detained in hidden “reeducation camps,” which are compared to “gulags” by the international press. Within this strictly regulated society, Chinese Muslims continue, nevertheless, to express their cultural heritage in houses of worship. 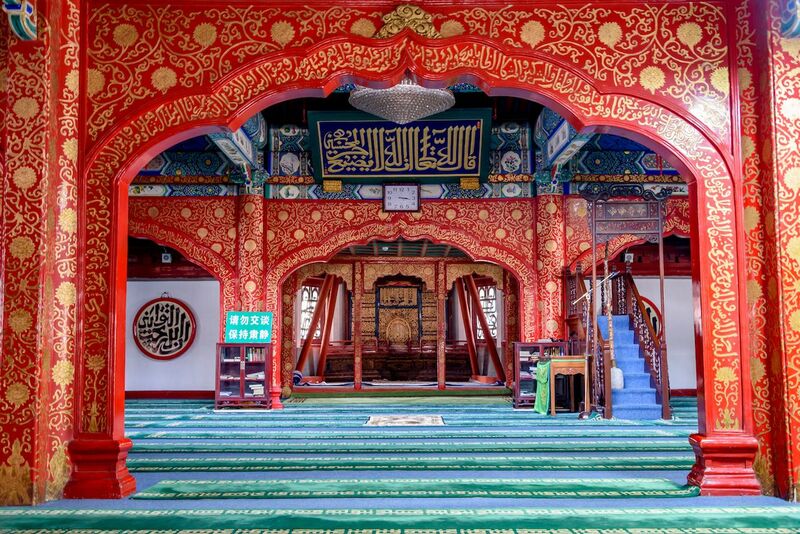 Here are seven of the most fascinating examples of mosques in China that are still standing. Said to be the largest and oldest mosque in China, the Great Mosque of Xi’an was founded in 742 AD in the old imperial capital located at the eastern opening of the Silk Road (although today’s structure dates back to the 14th century). 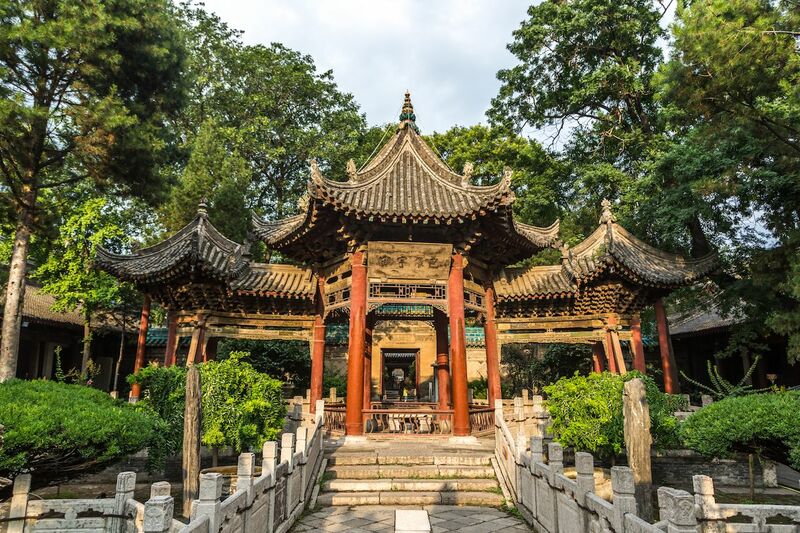 This building, divided into four courtyards and surrounded by well-tended gardens, blends traditional Chinese architectural elements — such as wooden arches topped with traditional, glazed-tiled, pagoda roofs — with Islamic art like stelae carved with Arabic, Chinese, and Persian inscriptions. Kashgar is another city of historical importance for its position on the ancient Silk Road as it’s located in the westernmost corner of Xinjiang, at the crossroads of China, Kyrgyzstan, Tajikistan, and Pakistan. Marking the heart of the city is the yellow Id Kah Mosque, one of the most highly regarded places of worship for the local Uyghur population. The mosque dates back to 1442 and is the largest mosque in all of Xinjiang, with a courtyard that can hold up to 20,000 people during religious celebrations. Erected during the Liao Dynasty in 996 and rebuilt centuries later after Genghis Khan’s armies destroyed it, the Niujie Mosque of China’s capital city is the oldest and largest mosque in Beijing with 42 different rooms, including a massive prayer hall that can contain up to 1,000 worshippers. 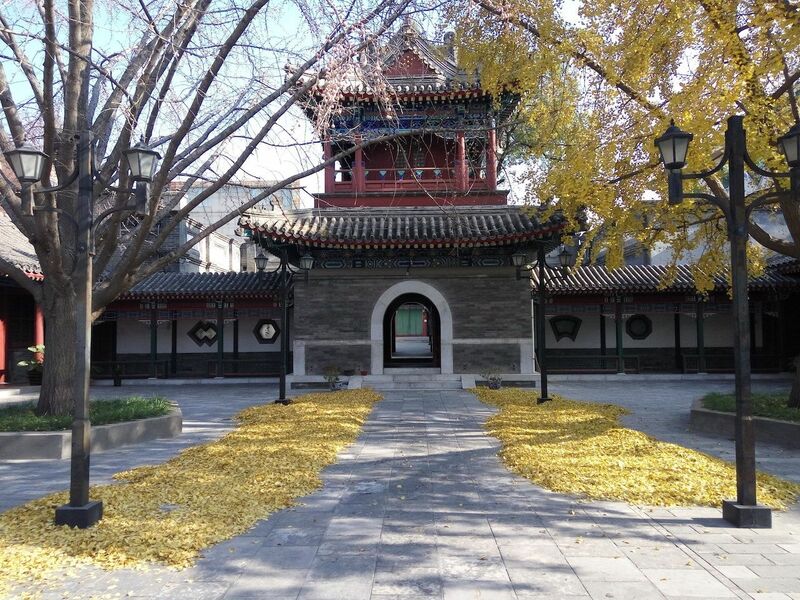 This religious and historical site also houses artifacts related to the Islamic tradition in China. Among the most significant ones are the stone tablets carved by Emperor Kangxi (1654-1722) that freed the Hui people from the accusations of conspiracy to overthrow the Qing dynasty. 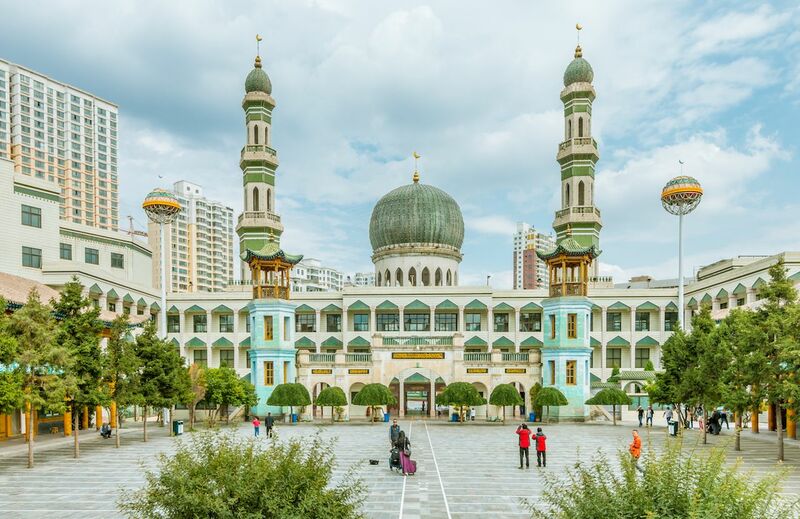 The Dongguan Giant Mosque in Xining was originally constructed during the initial stage of the Ming Dynasty (1368-1644) but has been renovated multiple times over the centuries, with the last restoration done in 1998. The complex surrounds an ample courtyard and features a double set of minarets, the taller ones in typical Islamic architectural style and the older turquoise pair topped by traditional upturned roofs. With a prayer hall built entirely in wood, the second largest mosque in Beijing is a unique sight. Like the Great Mosque of Xi’an, the Dongsi Mosque is a mix of Imperial architecture and Islamic art. The origin of the Dongsi Mosque is still debated today, with some saying that it was erected in 1356 during the Yuan dynasty and others dating it back to 1447 when general Chen You allowed for its construction under Ming rule. The prayer hall is capable of welcoming 500 devouts, and the library it houses contains valuable Islamic manuscripts, including a hand-written copy of the Quran dating from the Yuan Dynasty (1279-1368). Although it looks like it would fit in perfectly in Uzbekistan, this mosque and its minaret are in the city of Turpan, in a scorching valley 120 miles from Urumqi, Xinjiang’s capital city. The Emin Minaret, a 144-feet tall tower built in honor of general Emin Khoja, who fought for the unification of China, is the tallest in the country. Erected in 1777-78, the Emin Minaret was designed in a typical conical shape and built with burnt brick. 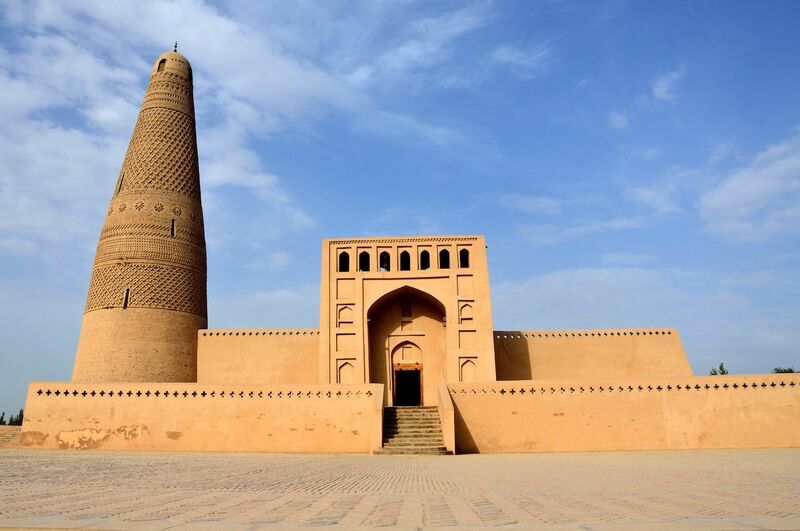 Next to the minaret, which you cannot enter, is the sand-colored Su Gong Ta Mosque, one of the largest of the Xinjiang Autonomous Region. According to Reuters, Turpan is home to a large Muslim detention camp. 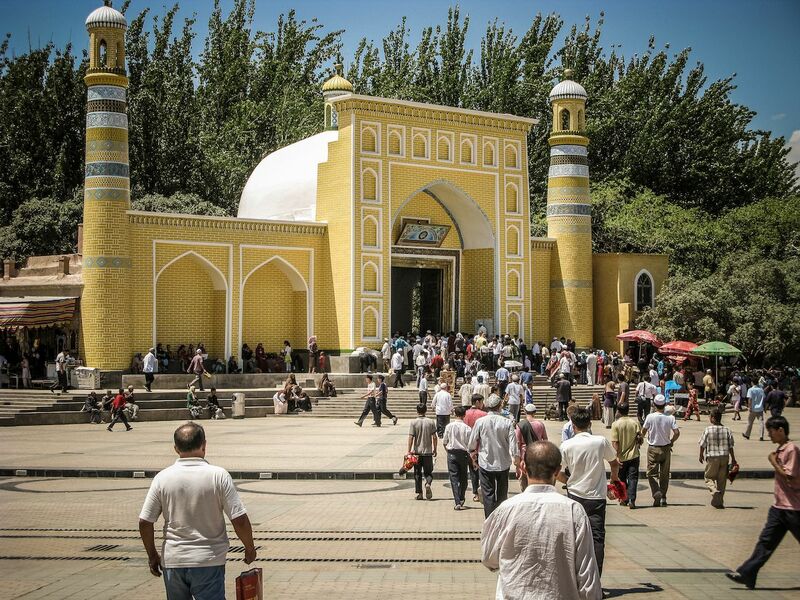 The Weizhou Grand Mosque, located in the Ningxia province where a large population of Hui Muslims lives, still stands after the demolition plan of the Chinese government was delayed due to thousands of protestors asking for it to be saved. The massive white building with several traditional domes topped with crescent moons and minarets was said to have been erected without the proper permits, but it appears that the Arabic architectural style of the mosque and the plan of the Chinese government to sinicize religion may be the real reason behind the demolition orders.